The 5th instalment of my ‘Local’s City Guide To’ series is here! This contribution comes from Rachel Wilson, author of The Dubai Diaries Blog and a proud member of the Emirates Cabin Crew. Rachel began her blog around the time she started her career with Emirates and nearly 5 years later, it’s still going strong. When she’s not flying the world for work, she’s making the most of her cheap staff travel tickets and exploring new places around the world. I thought Rachel would be the perfect person to write a Local’s City Guide to Dubai, so that’s exactly what she has done. Over to Rachel! Dubai is the biggest and most well known city in the United Arab Emirates, despite not being the capital (that title is held by neighbouring Abu Dhabi). It’s one of the seven Emirates that make up the UAE and is located in the heart of the Middle East. It’s the perfect gateway to the rest of the world, as many cities in Europe, Asia and Africa are just a 4-5 hour flight away. Australia and the US are around a 12-14 hour flight away, so many people come to visit as a quick stopover on their way, but I would definitely recommend spending more than just a 24-hour layover here! Dubai started out as a humble pearl fishing village but has grown to become a major world hub in the past 30 years alone. It’s famous for its extravagant structures and elaborate skyscrapers including the Burj Khalifa. 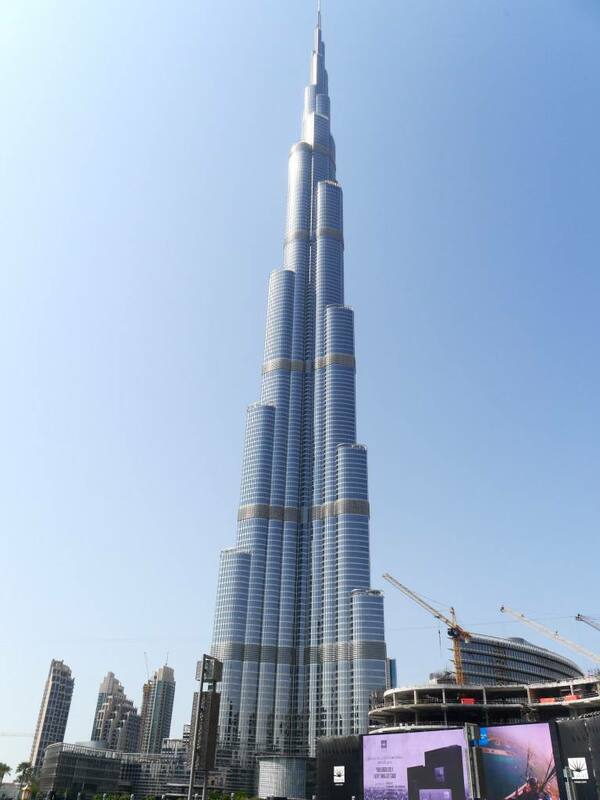 Standing at 830m, it’s the world’s tallest building. I moved here at the end of 2012, after accepting a job offer from Emirates to work as a flight attendant, and I haven’t looked back since! I love Dubai for the amazing diversity you can find here, from all of the different nationalities and cultures, to the food and surprising amount of things to do here. There’s more to Dubai than just a long weekend, but if you’re only spending a few days in the city I’d recommend getting up early to make the most of your time. Start out by discovering Old Dubai, this is the real heart of the city. Head towards the Al Fahidi Historic District, and have a walk around through the beautiful alleyways which are built in the traditional style of architecture. You can also visit the Dubai Museum for 3 Dirham (approx. £0.60), which gives you a great insight into the history of Dubai and what it looked like 15-30 years ago. Around the same area you can walk along the Creek and take an abra (a traditional wooden boat) to cross to the other side for just 1 Dirham! Once you cross over you’ll arrive at the spice and gold souks, which are a must-do for any visit to Dubai. Be prepared to bargain if you want to buy any spices, and just immerse yourself in all of the smells and sounds. 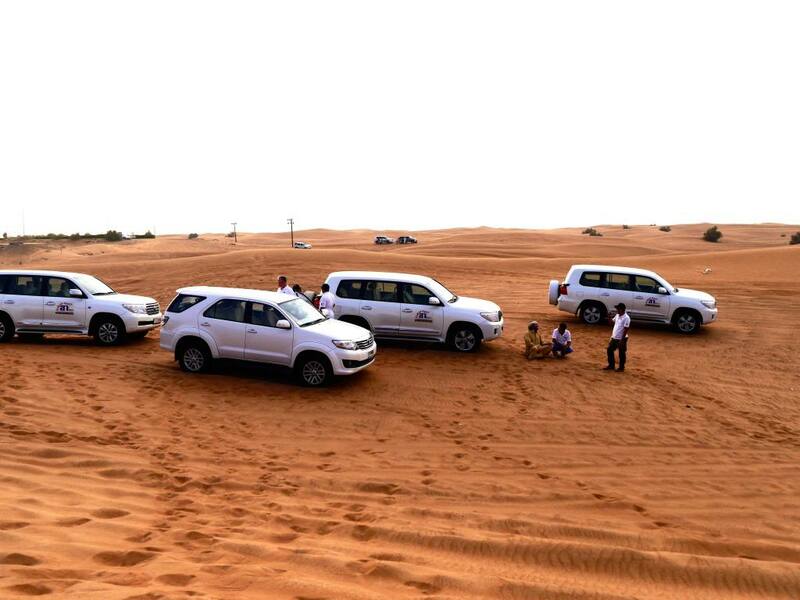 Escape from the city lights and go on a desert safari! I’ve been on quite a few of these whilst entertaining guests, and they always love it. Your driver will come and pick you up in a 4×4 and you’ll drive out to the middle of the desert, where you’ll drive over huge sand dune. It’s an exhilarating and adrenaline-fuelled activity. After the “dune bashing” you can ride a camel, try on the traditional “abaya” and “kandura”, the national dress, and even get a henna tattoo, before being served a buffet dinner with Arabic dancing to keep you entertained. Although it might seem a bit cliché, if you don’t mind splashing a bit of cash, I’d recommend treating yourself to drinks at the restaurant at the top of the Burj Khalifa, At.Mosphere. Make sure to request a table by the window so you can see the incredible view over the whole city! 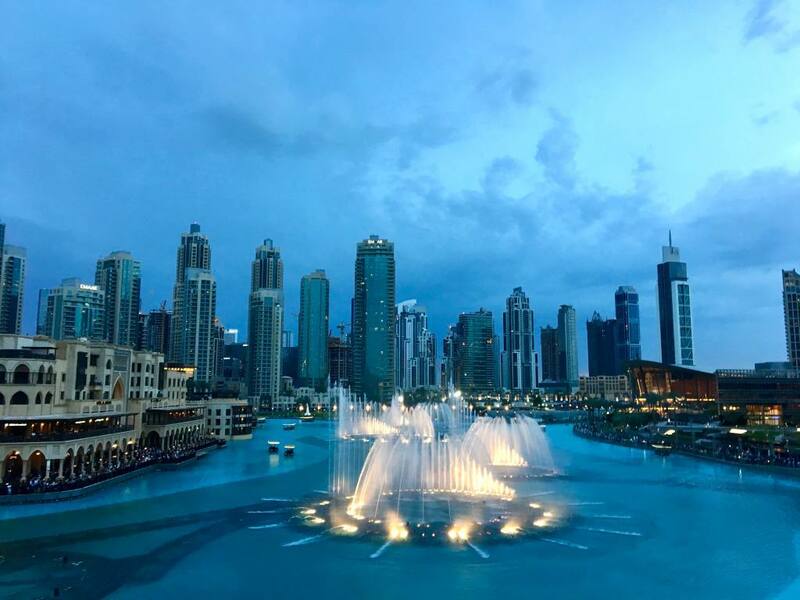 Not only that, every half hour from sunset onwards, you’ll be able to watch the Dubai Fountains, which are truly a sight to behold. If you’ve spent the previous day sightseeing, you’ll definitely want to spend a bit of time relaxing on the beach or at your hotel pool. A great place to relax is JBR beach, where you can rent sun loungers, umbrellas and towels. There’s also a whole host of restaurants, cafés and shops to keep you entertained once you’ve had enough of the scorching sun. Everything in Dubai has to be the biggest and the best, including the shopping malls. 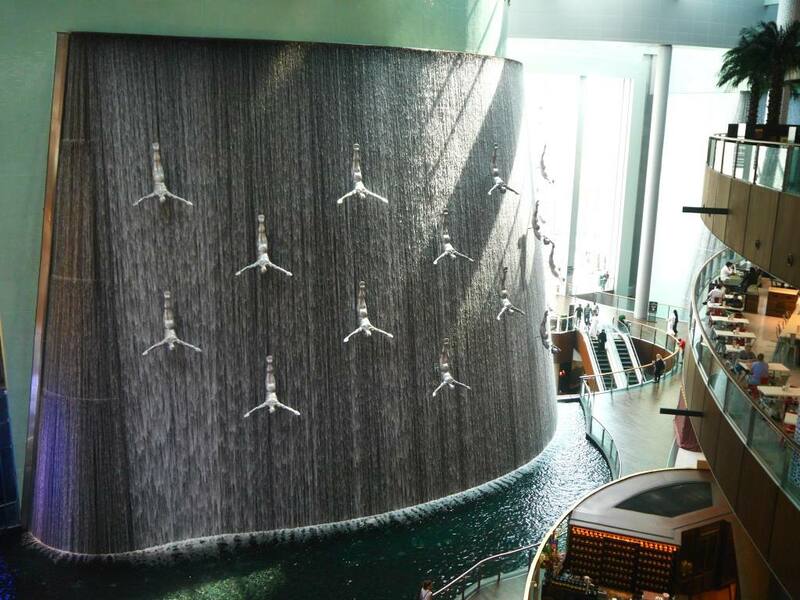 Dubai Mall is the world’s biggest shopping mall with a staggering 1,200 shops. It was the most visited building on the planet in 2011, attracting over 54 million visitors. But even if you’re not interested in the shopping, it’s worth a visit to see the Dubai Aquarium and Underwater Zoo. The aquarium showcases more than 300 species of marine animals including sharks and rays and can be found in the centre of the mall. 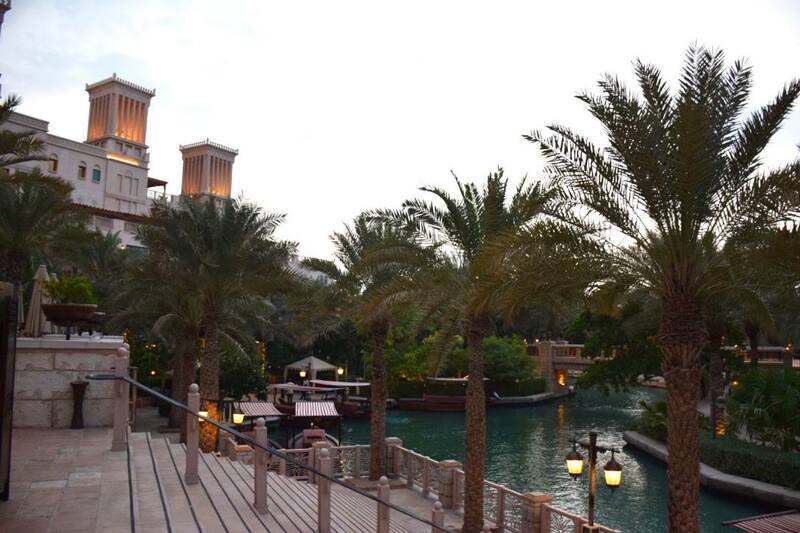 For sunset dinner and drinks, head to the Souk Madinat. Similar to the real souqs, this is a maze of cute alleyways, shops, restaurants and rooftop bars, with a perfect view out to the Burj Al Arab, the only 7 star hotel in the world. For amazing steaks, I can highly recommend The Meat Co, and if the weather is still not too hot, you can sit directly out on the water. Go Skiing in The Desert! For something a bit different, head to The Mall of the Emirates for a spot of indoor skiing! You can rent all of the gear needed and if you don’t fancy hitting the slopes, there’s an alpine-style café halfway up and adorable penguins that you can cuddle at the bottom! New restaurants pop in Dubai every week and the choice can be overwhelming at times. Here are some of the ones that I love and have tried and tested many times. I’ve tried to include a mix of high end and low end, as well as a few different types of cuisine to reflect the variety on offer in the city. Gate Village 6, DIFC (Dubai International Financial Centre), Licensed. Incredible Japanese food, sushi and delicious innovative cocktails. On the pricey side so more of a special occasion restaurant. Melt in your mouth steaks with plenty of side dishes to choose from and a great wine selection. There are two locations, one in Souk al Bahar overlooking the Dubai Fountains, and one at Souk Madinat overlooking the Burj Al Arab. Licensed. Another Japanese restaurant serving up the freshest of sushi. It’s always full of Japanese people, which means it must be good! Superb view of the Dubai skyline and a perfect sunset spot. A causal eatery at Dubai Mall, with a great outdoor and indoor space and a perfect view of the fountains. A whole mix of affordable cuisine from East to West, to suit every taste! A Dubai classic; certainly nothing fancy but what Ravi lacks in décor it definitely makes up for in flavour! Super cheap Indian and Pakistani food with a huge variety of delicious curries. An institution in Dubai! All of the bars I’ve selected here have something in common, they are all rooftop bars with a gorgeous view of the Dubai skyline! Located on the 43rd floor, this casual bar plays chilled out lounge music and serves up yummy cocktails. They even have heaters and blankets out in winter (when it drops to a ‘chilly’ 19 degrees at night). 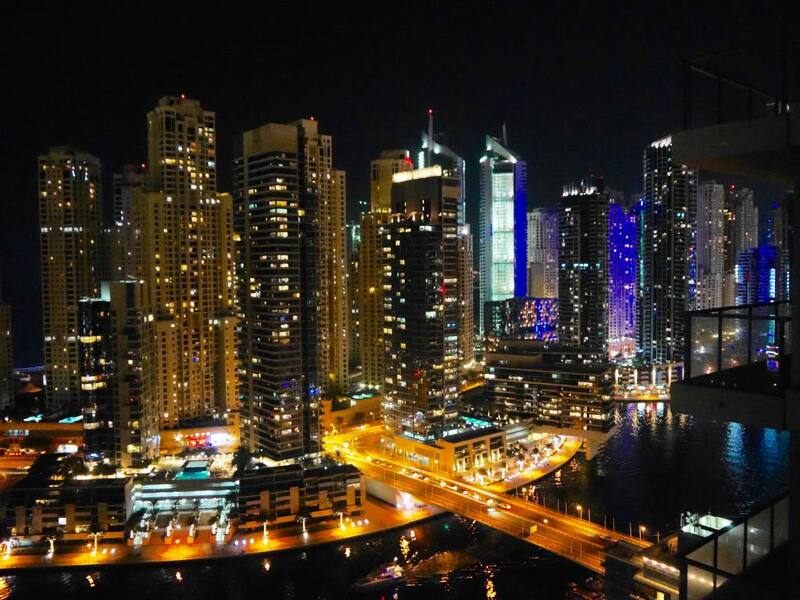 This bar along JBR has a breath-taking view out to sea and offers unlimited drinks to ladies on Tuesdays (there are tons of bars that offer Ladies Nights on Tuesdays, usually where ladies get unlimited free drinks!) But be warned, this place can get very windy because of the close proximity to the ocean. Offering a panoramic view of the Dubai Marina, this is another great bar for cocktails or a glass of wine, perched up on the 52nd floor of the Marriot Hotel. A slightly pricier option, but you’re paying for the location as it looks directly onto the Burj Khalifa. 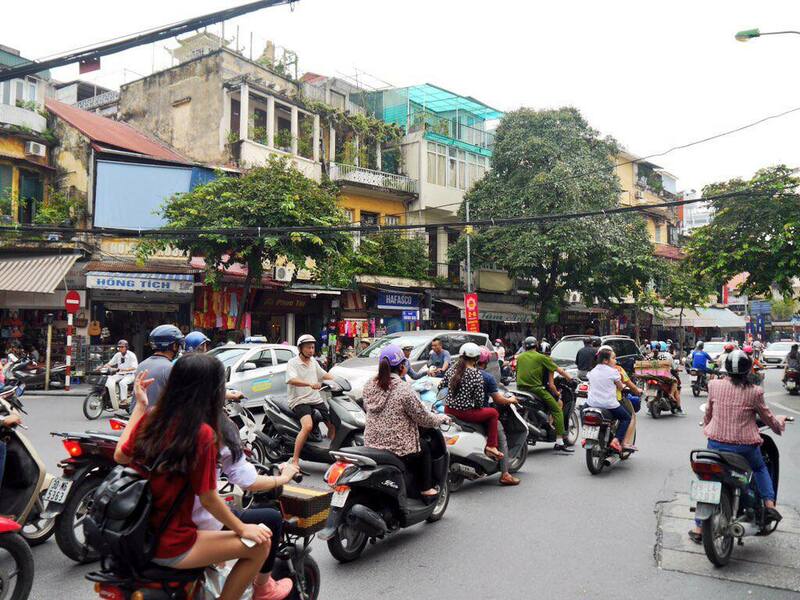 Covered with air-con in summer and open air in winter so you get a nice cool breeze. A relaxed and chic spot perfect for sundowners. Expect a great chilled out vibe with a stunning view of the skyline. 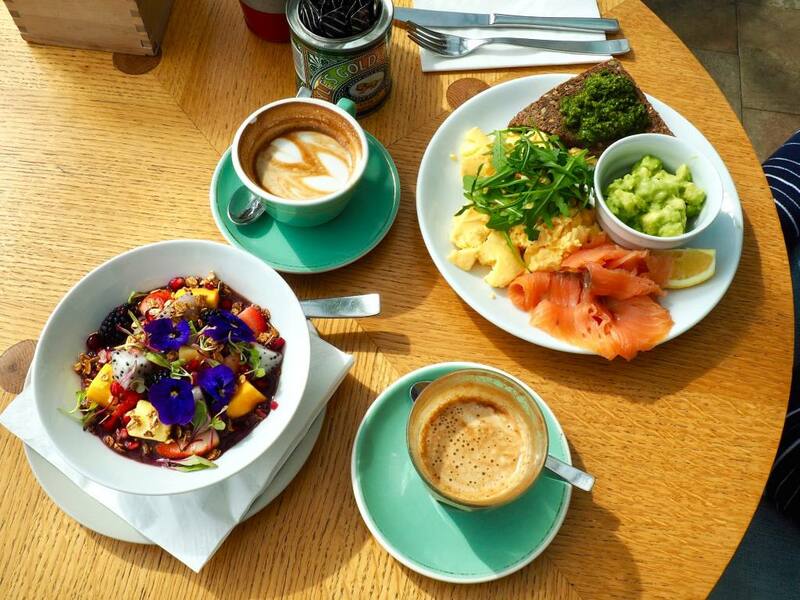 This is an Aussie style café/restaurant, serving up the best breakfast, brunch and lunch options. They also do excellent coffee and have a huge counter full of homemade cakes and pastries. Make sure you try the cronut! A little bit pricier than the others, however worth the extra few dirhams for the delicious eggs, salads and freshly squeezed juices. Definitely one for when you’re feeling indulgent. This café serves up everything American style, including the portion sizes! They even have the southern classic of chicken and waffles. If you’re looking for something sweet, make sure to try the brioche French toast with caramelized bananas. Tucked away inside the Dubai Garden Centre, you wouldn’t even know this café is here if you hadn’t heard about it. The acai bowl is not only fresh and delicious, but also perfect for Instagram! Although you might not want to head to a mall for your Sunday brunch, I would certainly say Common Grounds (located inside Mall of the Emirates) is worth it. 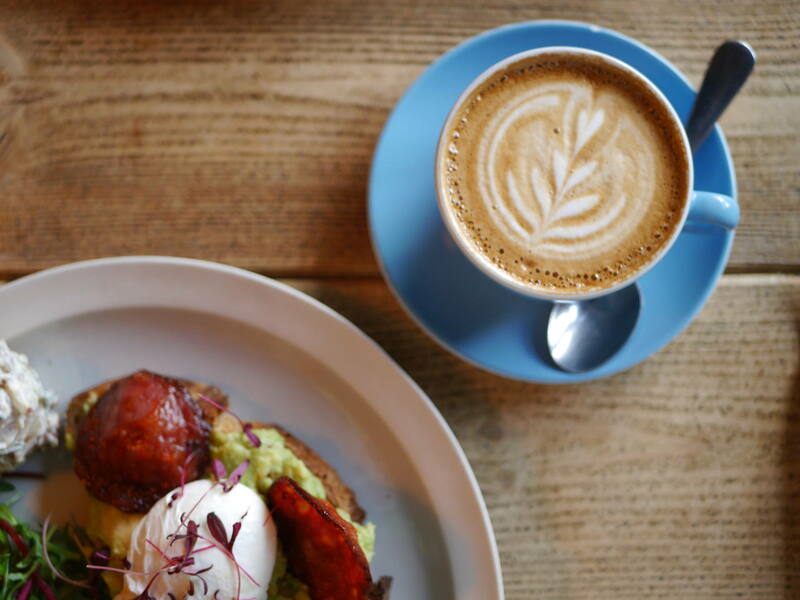 It’s another Aussie style café serving up breakfast ‘til 3pm, with awesome avocado on toast. This one is fairly new, nestled in amongst the designer shops at City Walk, with a stunning interior made mostly (as the name would suggest) out of brass. They have a varied selection of speciality coffees, such as a Middle Eastern inspired rosewater and honey coffee. 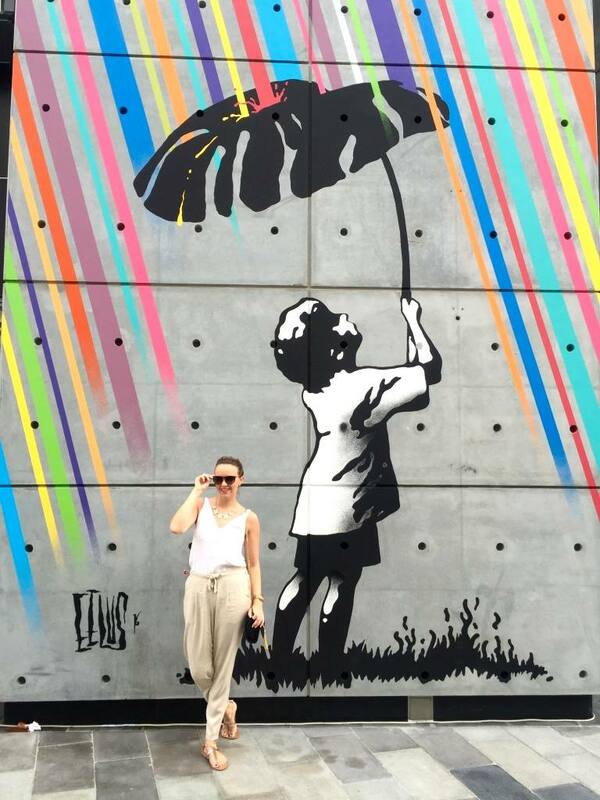 While you’re in the City Walk, you can explore all of the amazing murals and cute European style streets. One of my favourites that I always end up going back to, perhaps due to the never-ending selection of cakes. The classic and most famous is definitely the carrot cake, but the summer cheesecake with berries is also one of my favourites and goes perfectly with a flat white. If you’re exploring Old Dubai and the Bastakiya region, pop into the coffee museum for an interesting read of how coffee has influenced the UAE. You can see all sorts of coffee makers and pots, including the traditional Arabic “Dallah”, which you would find in every local’s home in Dubai. If you want something a bit different, try the Ethiopian coffee, which comes with a side of popcorn! Tucked away in a converted villa in Jumeirah, Stomping Grounds roast all of their own beans and have baristas on hand ready for coffee recommendations. It has a quaint and rustic feel to it, perfect for a relaxing morning. Owned by the same guys behind The Sum of Us (see best brunch places), this is a huge open warehouse serving up delicious coffees, always made sure to be served at a certain temperature for optimum tastiness! When in Dubai you definitely have to try some of the local Arabic food, and there’s no better place for it than Al Hallab. There are a few different restaurants around the city. I would recommend starting with a few mezze items, such as hummus, moutabel (a creamy aubergine dip) and muhammara (a red dip made from ground walnuts, red pepper and pomegranate molasses). 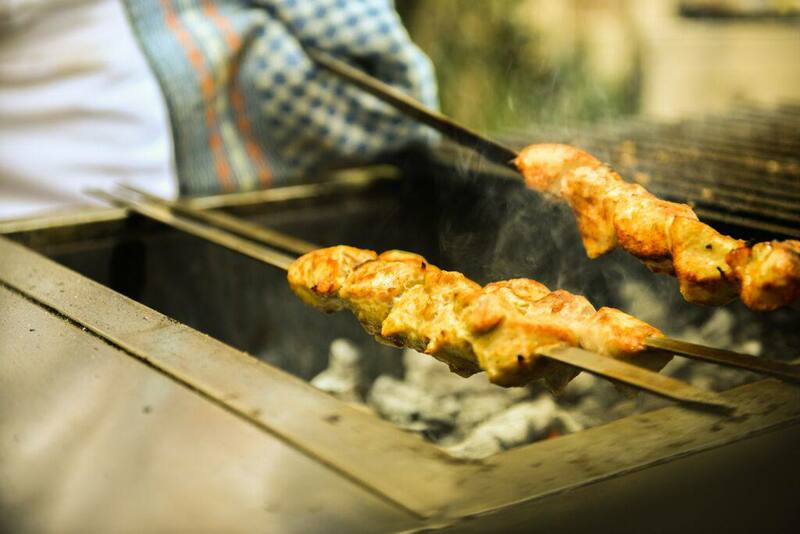 These are traditionally eaten with the warm, fresh Arabic bread, rather than cutlery! To drink make sure you get the lemon and mint juice, a refreshing mocktail that is found all over the city. The Dubai Mall branch is great as it has a terrace which you can sit out on during the cooler months and watch the fountains from. 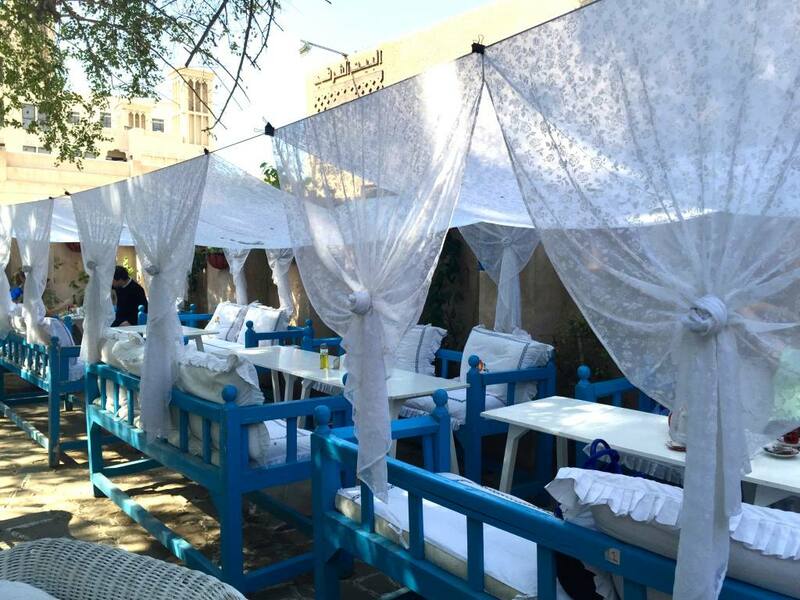 This place is located in the historic Al Fahidi district, so stop here for a cup of tea or Arabic coffee once you’ve finished exploring Old Dubai. Tucked inside a courtyard, full of floaty white drapes which blow in the wind, this is the perfect hidden gem to spend a bit of time putting your feet up after a lot of walking. Slightly out of the main city, you’d never expect to find this restaurant in the middle of the desert. It’s surrounded by beautiful flowers, trees, lakes and water features, which really make you feel like you’re not in Dubai any more – a superbly tranquil place. Dubai is more well-known for the luxury end of the scale when it comes to hotels, and there’s certainly no shortage of 5-star hotels to stay at in the city. However, if you’re on a bit of a tighter budget, I would suggest the Rove Downtown. Just across from the Dubai Mall, there’s no compromise on views as you look out to the world’s tallest building, the Burj Khalifa. Book now. 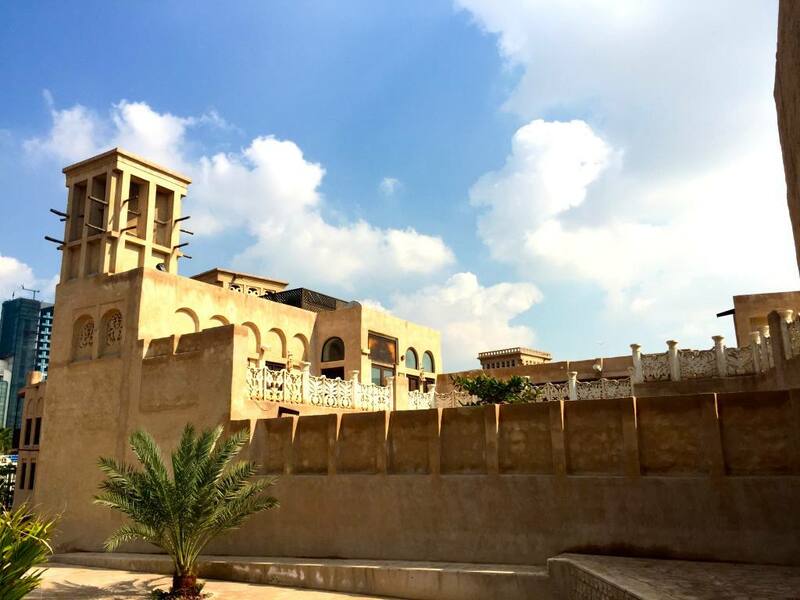 If you’re looking for something a bit different than one of the big chain hotels, try the XVA Art Hotel located in the historic Bastakiya region (which is where you’ll really get a taste of “Old Dubai”). The hotel only has 14 rooms, which all have different types of local art and cultural motifs on display. There are also 3 shady courtyards, which are perfect for lounging in with a good book. Book now. Bab Al Shams hotel, located slightly outside of the city and in the middle of the Arabian desert, is the perfect luxury getaway. Featuring an infinity pool looking out across the sand dunes, and a spa offering all sorts of treatments, this hotel is perfect for a romantic couples break. Book now. 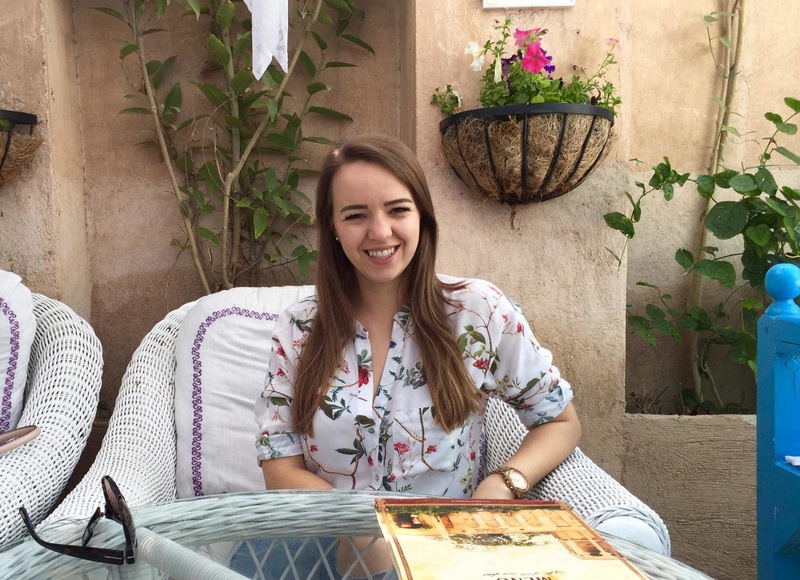 Rachel runs The Dubai Diaries alongside her full time job as a member of the Emirates Cabin Crew. Rachel first discovered the world of blogging when she was reading blogs from other cabin crew members. She created the blog to document her new life in Dubai and all of her exotic travels. You can find Rachel on Twitter as @rachelwwilson and Instagram also as @rachelwwilson. I just gone through this post. i know this is a year old post. but if you visit dubai now, you have got lot more to do. Dubai is changing to the better one each day.., It is developing to the years. Thanks Susan! You’re right. It’s a diverse and ever-changing city. I’m off to Dubai next week so this is perfect. Can’t wait to try some of those restaurants and bars!